In our daily life, we come across televisions, computers, CD players and many other devices with speakers producing sound to watch programs, movies, listening music, news etc. with audio. The sound of these devices can be altered in order to achieve the good audible sound according to the requirement of the listener. This sound can be increased or decreased by using the electronic device namely Amplifier. The amplitude of a signal waveform can be increased by using an electronic device called as an Amplifier. By consuming energy from a power supply an electronic amplifier increases the power of a signal to control over the shape of the output waveform which indicates the identical input signal but output signal will be with larger amplitude compared to the input. 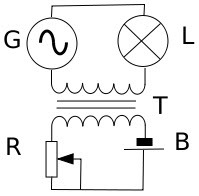 The general symbol of an amplifier is shown in the below figure. As the amplitude of the waveform is getting amplified (modified or increased) these electronic devices performing this amplification process are named as Amplifiers. The classification of amplifiers has done based on the different criteria such as size of the signal, circuit configuration, operation and etc. There are different types of amplifiers, including Voltage amplifiers, Operational amplifiers, Current amplifiers, Power amplifiers, RC coupled amplifiers, Vacuum tube amplifiers, Magnetic amplifiers and so on. The electromagnetic device used for the amplification of electrical signals which utilizes the magnetic saturation of core principle and certain class of transformer’s core non linear property is called as Magnetic amplifier. It is invented in early 1885 and is primarily used in theater lighting and it is designed with basic of design Saturable Reactor and hence can be used as saturable reactor in electrical machinery. In above figure, amplifier consists of two cores with control winding and AC winding. 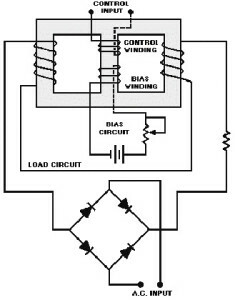 By using small DC current fed to control winding the large amount of AC currents on AC windings can be controlled and it results in current amplification. 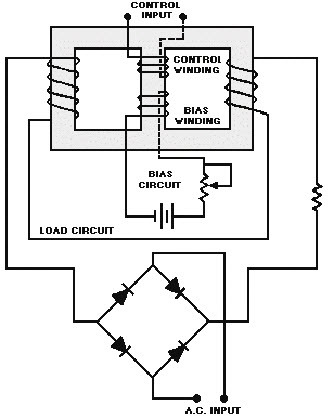 Two cores are connected in opposite phase for canceling the high flux generated AC current in control windings. The magnetic amplifier can be used to convert, multiply, phase shifting, modulate, magnify, invert, pulse generation, etc. It can be simply called as one type of control valve using an inductive element as control switch. Earlier in this article we studied that it is designed based on the design of the saturable reactor, which consists of major parts such as DC source, magnetic core (with windings) and AC source. Saturable reactor works on the principle by varying the saturation of the core the current flow through a coil wound on a magnetic core can be varied. By saturating the magnetic core the current to can be increased and by desaturating the magnetic core the current to the load can be decreased. In the period of 1947 to 1957 decade, it was mostly used for low frequency applications and in power control applications. But after the establishment of transistor based amplifiers these are reduced to using in large extent, but still these are used in combination with transistors for some extremely demanding and high reliability intended applications. These are divided into two types as half wave and full wave magnetic amplifiers. Whenever DC supply is given to the control winding then the magnetic flux will be generated in the iron core. With the increase in this generated magnetic flux the impedance of the output winding will decreases, then the current flowing from the AC supply through the output winding and load will increases. 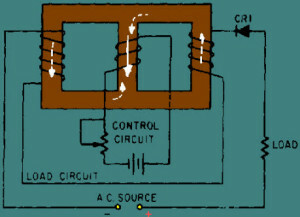 Here it utilizes only half cycle of the AC supply; hence it is called as a half wave circuit. At the core saturation point, at which the car is having a maximum flux it can hold, as the flux is maximum the impedance of the output winding will be very low making very high current to flow through the load. Similarly, if the current through the control winding is zero, then the impedance of the output winding will be very high making no current to flow through the load or output winding. Hence, from above statements we can say that by controlling the current through control winding the impedance of the output winding can be controlled such that we can vary the current through the load continuously. 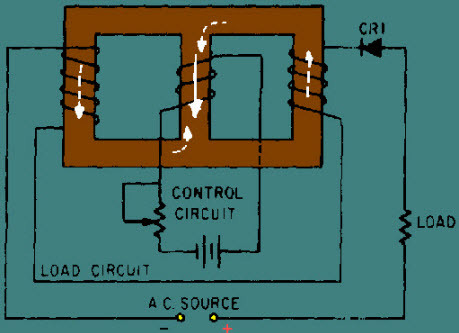 A diode is connected to the output winding as shown in the above figure which acts as a rectifier, used for reversing the polarity of the AC supply constantly from canceling out control winding flux. To avoid the cancelation and the direction of current flow through the secondary can be varied to reinforce two fluxes each other created by control winding and the output winding. It is almost similar to the above half wave amplifier circuit, but it utilizes both half cycles of the AC supply, hence it is termed as a full wave circuit. Due to wound of the two halves of the output winding the direction of magnetic flux created by these two halves in center leg is same as direction of control winding flux. Even though no, control voltage is supplied there will be some flux present in magnetic core, hence impedance of the output winding will never attain its maximum value and current through load never attain its minimum value. 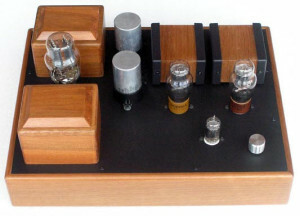 The operation of the amplifier can be controlled by using the bias winding. In case of vacuum tube amplifiers, certain part of its characteristic curve can be operated by the tube. Many of the magnetic amplifiers will be having an additional control winding which is used to tap the output circuit current and give it as feedback control current. Hence this winding is used for giving feedback. These are typically used in radio communications for switching the circuits of high frequency alternators. It can be used for the speed regulation of Alexanderson alternators. Small amplifiers can be used for tuning indicators, controlling the speed of small motors, battery chargers. Before Hall Effect current transducers, for the detection of wheel slip locomotives uses these amplifiers. These are in HVDC for the measurement of the high DC voltages without any direct connection to high voltages. Due to the advantage of these amplifiers, controlling high currents by using small currents, these are used for lighting circuits such as stage lighting. It can be used in arc welders. In mainframe computers during the 1950’s it is used as a switching element. In 1960’s these are typically used in electrical power generation systems. The advancement in technology reduced the usage of these amplifiers in greater extent but still these are used in some special applications and electronic projects kits. Do you know any application of amplifier, especially in which these types of amplifiers are still being used? Then please post your ideas by commenting below. Magnetic amplifiers are still used in the majority of large arc-welding machines due to their very high power capabilities and the excellent stability of current control they provide.